If you were going to put together a highlight reel of the best, most influential models of language and brain, what would they be? You gotta start with the single-node model of Broca, then Wernicke's two-node, dual stream "connectionist" model. But what then? Lichtheim I suppose (although I think he ended up doing more harm than good despite his good intentions). Any Freud fans? Not very influential, though. Geschwind for sure. Anything in between? Our new article, "The Cortical Organization of Speech Processing" has recently been published in Nature Reviews Neuroscience, 8, 393-402(May 2007). Although it is an extension of the model we proposed in our 2000 TICS and 2004 Cognition papers, there are several new features in the current proposal. One is the claim that within the ventral stream there are parallel routes from acoustic input to lexical access. Another is that within the dorsal stream, there are also parallel circuits, one supporting auditory-motor integration at the phoneme level, and another supporting auditory-motor integration at the level of sequences of phonemes or syllables. We also suggest that the dorsal auditory-motor integration system may be fundamentally organized around the vocal tract effector system, rather than the auditory-system per se. More on these recent claims in future posts. Let us know what you think of the new paper! Hickok, G., Poeppel, D., Clark, K., Buxton, R.B., Roberts, T.P.L., & Rowley, H.A. (1997). Sensory mapping in a congenitally deaf subject: MEG and fMRI studies of cross-modal non-plasticity. Human Brain Mapping, 5, 437-444. Gage, N., Poeppel, D., Roberts, T.P.L., & Hickok, G. (1998). Auditory evoked M100 reflects onset acoustics of speech sounds. Brain Research, 814, 236-239. Then, once we felt reasonably secure in our careers having landed faculty positions (me at UCI in 1996 and David at UCSF in 1997) we quickly turned to working on theory development. 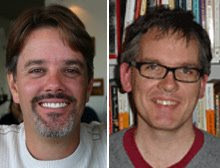 What started as a simple position piece pointing out that speech perception is more bilateral that most people appreciated (Hickok & Poeppel, rejected 1999, Neuron), morphed into the dual stream model presented in 3 installments: 2000 TICS (nearly rejected), which focused on speech perception being bilateral and task-dependent; 2004 Cognition (nearly rejected) which explicitly tied the model to dorsal and ventral streams and showed how it explained aspects of aphasia; and finally 2007, by which that time we had done enough empirical work on the dorsal stream (my Spt-related stuff) and the ventral stream (David's AST stuff) to back up the claims with hard data. I still believe most of what we said in that 2007 paper. Thanks for reading and contributing to Talking Brains! 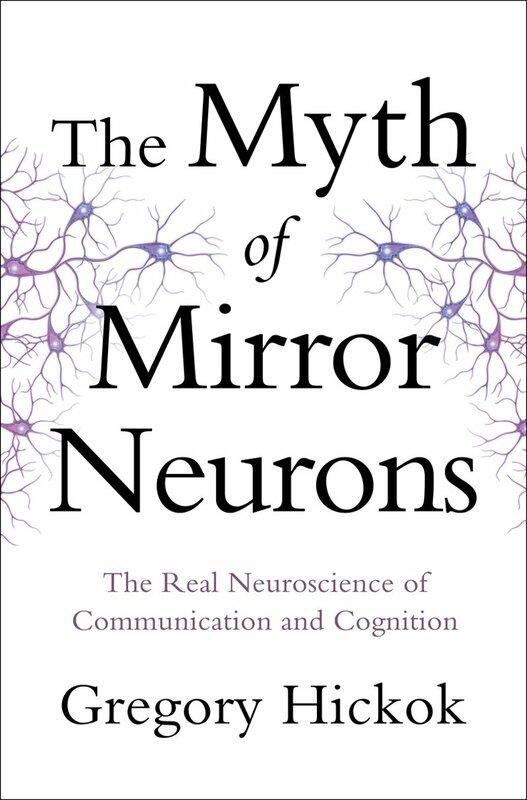 My forthcoming book, The Myth of Mirror Neurons: The Real Neuroscience of Communication and Cognition is now available for pre-order on Amazon. You had to know this was coming given my obsession with, and frustrated rantings about mirror neuron theory in many posts on this blog. Writing this book (my first) was a really fun and interesting experience. It forced me to look deeply not only into data and theory concerning mirror neurons and the human mirror system but well beyond it in areas that the mirror neuron phenomenon has touched: imitation, embodied cognition, theory of mind, autism, empathy, and lots more. I actually learned quite a lot. In the end, the book is about the cognitive neuroscience of communication and cognition more broadly, using mirror neuron theory as a theme. For those of you who think this might be nothing more than a destructive barn-kicking exercise, rest-assured, it's more than that (although I do my share of kicking). I spend a good deal of space in the book developing alternative's to the Parma story using their own data and talking about a lot of other relevant phenomena and theoretical ideas. As always, I welcome feedback from the blogosphere. In fact, my ideas were shaped to some extent by interactions with people commenting on my many posts, so I owe all you commenters a big thank you.